At 226 we get asked this question a lot and our response is always the same, NLP is a methodology and attitude that enables you to live your life in a way that is congruent to you and those people you CHOOSE to share your life with. Once you have decided to take a look at your life from a different perspective, you will find that almost immediately you have more options and avenues to explore to make your life the one you want as appose to the one you think you have. We find that people we work with have forgotten or chose to ignore the fact that they have a choice (YOU ALWAYS HAVE A CHOICE), but remember that with choice comes consequence. 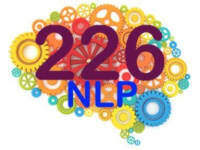 With NLP and 226, you will find the assurance that every decision you make, providing you have considered all resources available to you (And remember YOU are a resource too), is the right decision regardless of the outcome.